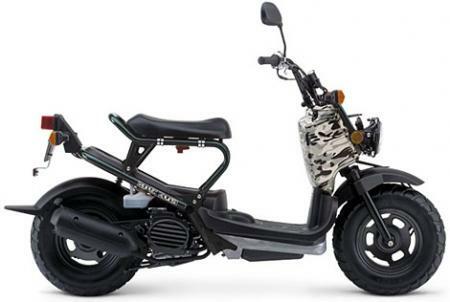 Description $100 REWARD for finding my Honda Ruckus Scooter! My 2005 Honda Ruckus scooter was stolen from the Trails Apartments on Bell Road next to Percy Priest lake late Friday night 9/26/08. The scooter is rather unique like the ones used by the metro police. It is mainly flat black with gray camo paint on the front. It has a large aoogah horn on the front above the headlights, though the thief may have removed it. It also has 2 blue stickers on the rear bars on each side that say Polini. The front camo box has several scratches from the keys and removal of other stickers. It also has a brown parking sticker for Heatherwood apartments on the right side of the front box. Probably the best indicators that it is my scooter are that I replaced the factory square mirrors with round mirrors and the plastic cover under the seat right next to the tail lights has 2 chunks cut out for the attachment of a cargo box. If you have any information leading to the return of my scooter please call 615-495-7597 or email me at [email protected] I am offering a $100.00 reward. Thank you.